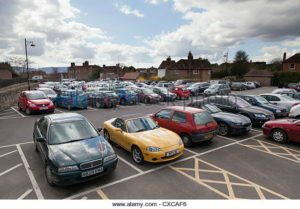 During an outing, you always worried about the availability of space for the parking of your vehicle in city or town.If parking space is not available in the desired location that you are supposed to park causes discomfort to you.But with the availability of little space for your car in your desired location, you can park your car but you should have a deep knowledge of various types of parking systems that you can use at that moment. For the effective parking of a vehicle, we will explain some most common methods or types of parking systems.These types of parking is now used by developed countries for the effective utilization of parking space.In developed countries, they have box line spaces only for parking on roadside.Let me introduce you some effective types of parking. In on street parking vehicles are parked along the sides of the road like we usually do.The width of the kerb required for parking depends on the angle of parking. 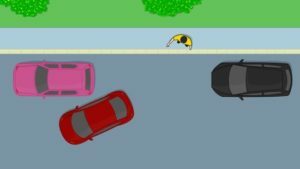 Street parking again classified into parallel parking and angle parking.Let me more explain about parallel parking and angle parking. Parallel parking need less roadway width. In Parallel parking, the number of vehicles that can be parked per unit length of road is least. Number of vehicles that can be parked, N= Parking length available/Length of wheel base , Length of wheel base is normally taken as 6m. 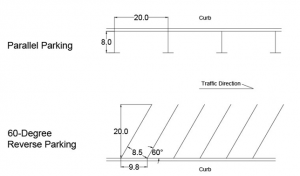 Angle parking is another method of on street parking in types of parking.In angle parking, the width of roadway required for parking increases with increase in parking angle up to a maximum at 90 degree angle. Angle parking accommodates more vehicles per unit length of the kerb. Maximum number of vehicles can be parked at 90 degrees. 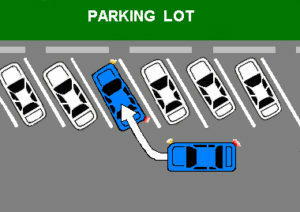 Angle parking is more convenient for drivers for parking and unparking operations. 45-degree angle parking is considered as best types of parking in angle parking. When parking facility is provided at a separate place away from the roadside or kerb, It is known as off-street parking.In off-street parking, there is no congestion, delay and hindrance to moving traffic vehicles as in on-street parking. The major drawback of off-street parking is, it is not possible to provide it at close intervals in the business centers of a city and it creates users have to walk a greater distance after parking the vehicles. Hope you can understand the various types of parking systems that you can use while you are going for an outing with your friends. An Ultimate Guide to Transportation Engineering.